Ideal small red microwave oven for those on a budget. None to mention - unless of course if you don't like the colour red! Looking for a resplendent red microwave? The Elgento E24003 may be the ideal model for you, featuring a sizable 17 litres worth of volume, and an overall output of 700w all wrapped up in a red shell. The Elgento dial based control system makes operating the solo microwave a piece of cake - this appliance is ideal for the elderly. Overall it offers pretty good value, and performs well - our test team were impressed with both it's performance and ease of use. 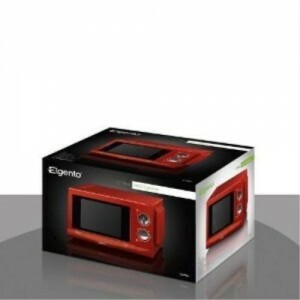 Why should you buy the Elgento E24003? If you're after a red microwave that's easy to use, then this appliance will be ideal for your needs.